In a saucepan on medium, melt butter & chocolate, stirring until smooth. Remove from heat. In a separate bowl, combine flour, cocoa, baking powder & salt. Gradually add to chocolate mixture & refrigerate 1 hour. Scoop dough onto cookie sheet & make a well in each cookie. Add a teaspoon of fluff. Bake 10 minutes. Meanwhile, heat your dipping chocolate according to instructions on the package. Add 1 heaping tablespoon peanut butter & microwave an additional 30 seconds. Stir until smooth. 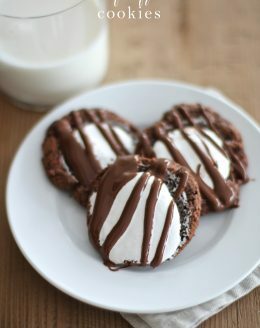 Drizzle chocolate peanut butter topping on your cookies & allow to set.